How many times were you stumped when you come to the subject of creating a highly keyword rich content driven website? Were you ever frustrated by a web based application software that promises great content but just don't seem to work and just generated blank pages? How about if you can own a single software that can search for all the content that you need, edit them with a built in editor and upload it straight to your website... all from the comfort of you desktop without any messy database installations needed! The Content Magnet is a DESKTOP BASED content website builder that makes it so easy to build a full content rich website and upload within minutes! Edit articles on the fly with built in editor. Able to upload directly to server via built in FTP program. Easy insertion of Adsense code for easy deployment. Get fresh articles and contents within less than 50 seconds tops! There's simply nothing to lose with this deal! Invest now! P.S. At this point after reading a typical offer, you probably think to yourself "Do you really want to gamble $1.50?". There is no way on earth that my product will not deliver, afterall you can start reselling this package as soon as you download them!. This application is programmed in Visual Basic and meant for Windows based computers. Just save it to your desktop and run it to install it. 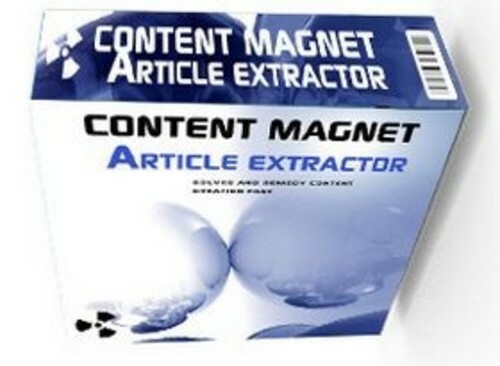 Then re-install the "Content Magnet Article Extractor". It should then work fine. Alternatively, use your favorite search engine to find a copy of the https://www.tradebit.com file from another dowbload location. Disclaimer: The income examples on this website are just that - examples. They are not intended to represent or guarantee that everyone will achieve the same results. You understand that each individual's success will be determined by his or her desire, dedication, background, effort and motivation to work. There is no guarantee you will duplicate any of the results stated here. You recognize any business endeavor has inherent risk for loss of capital. Waste of money it doesnt work!